The latest version of PostgreSQL 9.6 is planned to be released later today, bringing with it some much anticipated features and updates. As the most advanced open source database, PostgreSQL strives to release a major version roughly once every year. With an active and collaborative community, this PostgreSQL release boasts impressive features and updates thanks to contributions from many of the highly knowledgeable community members. 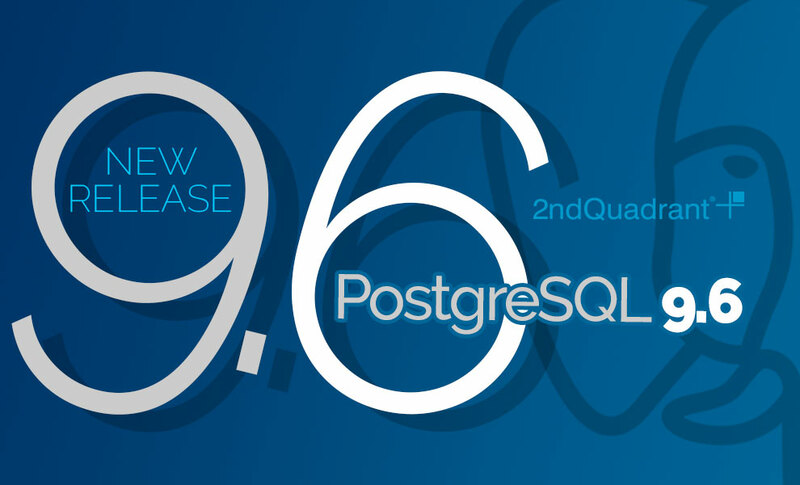 The expanding team at 2ndQuadrant has continued to show dedication to the PostgreSQL database project by contributing heavily to the PostgreSQL 9.6 release. Parallel execution of large queries has been a known shortcoming of PostgreSQL for some time, but this is no longer an issue with the 9.6 release. David Rowley and Simon Riggs contributed to this effort through working on initial support for parallel execution of large queries and the capability of an aggregate function to be split into two separate parts. For example, now the parallel worker processes can cooperate on computing an aggregate function. David and Simon worked alongside Robert Haas, Amit Kapila, and many others to develop this robust feature. The team at 2ndQuadrant is passionate about Open Source and PostgreSQL. To us it’s not work, but pursuit of knowledge, and drive to improve the growing database that our business is built around. This clearly shows through the continuous contributions and commitment to serving our customers and the community with integrity and cutting edge support and development. Continuous growth and success of PostgreSQL not only benefits our customers but the community as a whole in which we belong. Which of these are BDR related, I wonder? Relatively few, actually. Most of the BDR work went into 9.5. The main things that’re BDR-related for 9.6 are logical WAL messages (which we needed for BDR) and CREATE EXTENSION CASCADE (which is nice to have). Sequence access methods were submitted but did not get in. Same for logical decoding timeline following / failover slots. A lot of time in 9.6 went into the pglogical submission, which has now morphed into the v10 logical replication patch series. The great majority of the work listed here for 9.6 is unrelated to logical replication and BDR.